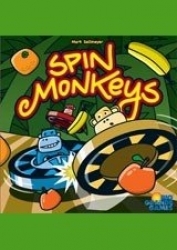 In Spin Monkeys, you are a monkey in the jungle when one day a wayward carnival makes a stop. You and your fellow monkeys jump in the bumper cars and away you go. You have no idea why there is fruit all over the arena floor, but you aim to grab as much of it for yourself as possible! Spin Monkeys has each player starting on a junction at the edge of the board with a hand of 5 cards. The cards have 8 possible degrees of rotation from 45 to a full 360 degrees. On each turn players choose a card, rotate their monkey clockwise to the degree, then move one junction per played card in front of them. As you go faster, traveling more junctions per turn, it becomes harder to avoid running into the sides of the board or other monkeys. When you bump into the side of the board you lose cards, slowing you down. If you crash into another monkey you get to spin them, and steal a piece of fruit. Game goes until only one kind of fruit is left on the board. Most points in fruit wins! "This is like a kiddy version of RoboRally, with the chaos and silliness quotients increased dramatically."